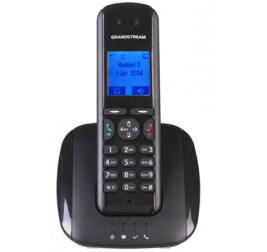 The Grandstream DP715 is a DECT cordless IP phone (Handset plus base-station) that can be used with both On-Premise or Hosted, SIP enabled call management switches. 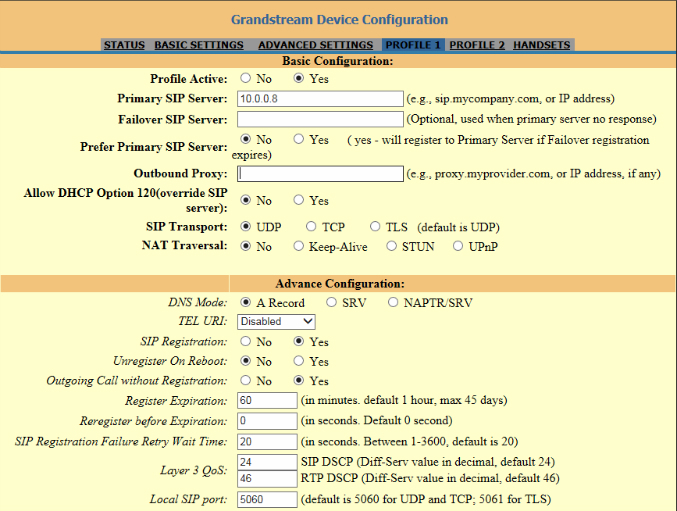 In this review, we will cover the Grandstream DP715 and provide our overall thoughts on the device as well as a brief installation section for configuring the device, in particular with FreePBX. Please note that the Grandstream DP710 is the same handset as the DP715 but comes with a charging base instead of a base-station. The DP710 is used to expand this solution to up to 5 handsets that are registered to a single base-station. Workers that are highly mobile within a facility would each find value in the Grandstream DP715. The device is essentially a DECT handset. It uses this technology to connect to the base-station. In most buildings, the device will communicate with the base station at 150 feet while if strolling around an open-ground campus, up to 1000 feet range is possible. Setting up the device is simple. With most hosted voice providers, the credentials required to connect and use the service will likely be included in a welcome email or on the company Wiki. Connecting to a company maintained PBX is slightly more involved while only taking a few additional minutes (at most) for those familiar with such systems. The handset and base are both small and lightweight. If using the belt clip to carry the phone around, it is not bothersome. Various built-in ringtones allow the user of any particular handset to program a unique tone, which is particularly useful when multiple phones are in use. Battery life specs come in at a respectable 10 hours of talk time, 80 hours of standby time and 16 hour charging time. From an aesthetic presentation standpoint, it will not blow anyone away. Lightweight charging bases that are easy to knock over. Address book functionality is not great and a lot of manual effort is required to properly configure this. Limited documentation available and what is available lacks detail. Some people may find the ringtones to be annoying. Small form factor and easy to use. Retails at $85.00 or less. Up to 5 handsets may be used with each base station with independent extensions. DECT functionality allows device to connect to station up to 150 feet within a building or 1000 feet if outdoors. Operation wise, nothing stands out as truly remarkable. Each station can utilize up to 2 SIP Trunk accounts. The Grandstream DP715 is not necessarily the most stylish or fully featured device on the market but it works. Any size of company needing mobility in the office will find this inexpensive IP phone to be functional while somewhat limiting. Setup guide for the DP715. 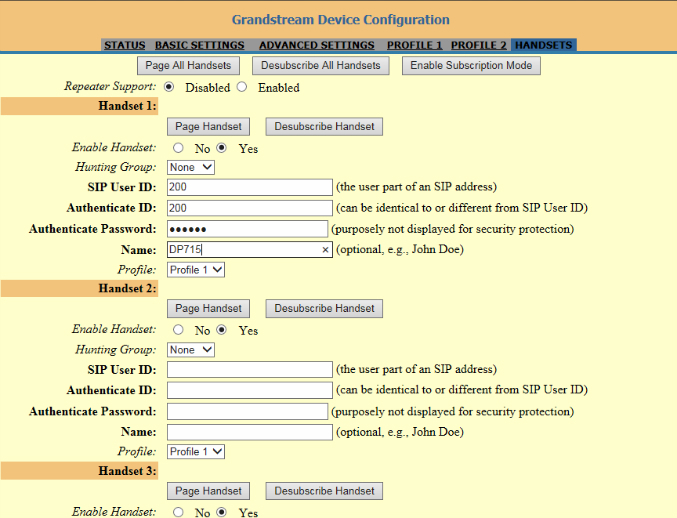 Guide to other Grandstream IP Phones and Adapters. The setup process will vary depending on the provider where the device ultimately connects. In our setup, we used an internal FreePBX system. The benefit for such a setup allows for quick deployment in smaller network settings and inexpensive call rates, contingent on SIP Trunk providers. After inputting the device IP address into a browser of choice, a login page will be the first obstacle to cross. Simply input the default password "admin" to gain access to the configuration console of the device. As we used FreePBX, configuring the following settings was necessary for proper operation. Note: After each configuration step, make sure to hit the Apply button at the bottom of the page and follow any additional instructions. 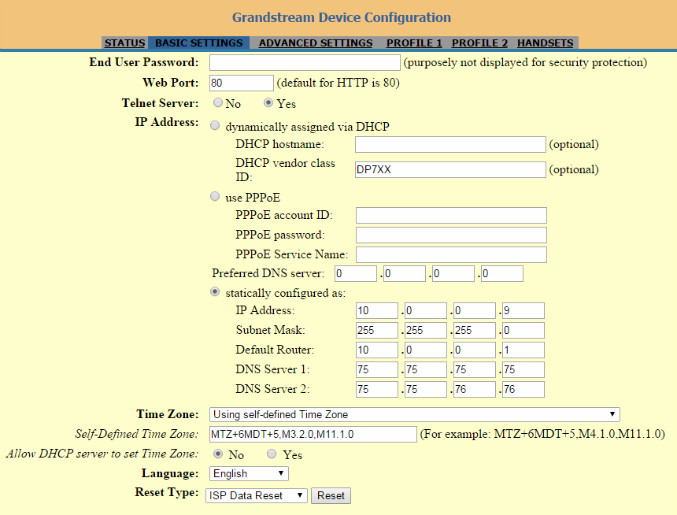 The next step configures the system to properly point to the PBX (or hosted service provider) allowing the phone to connect to other devices on the internal network, as well as regular landlines and mobile phones. Refer to figure 2 - though a lengthy page, it only requires one change (possibly two, depending on voice quality.) Make sure the profile is marked active, input the IP address of the server (in this case the on-premise FreePBX system) and be aware that NAT Traversal may need changed from "No" in certain scenarios. The final step is to configure the handset. In figure 3 you can see that I have Handset 1 configured with a user (extension 200) created in FreePBX. After applying these settings, the phone should be ready to go. For the price, the Grandstream DP715 is a decent device. It does not have all the bells and whistles of other wireless sets but it is still a great phone. This device would make a good addition to a small office or any business where users are on the move. Potential buyers may also want to consider the Yealink W52 cordless IP Phone. We're sorry, there are currently no user submitted reviews for Grandstream DP715 matching your search criteria at this time. Please add your own review or check back later as reviews are being submitted often.